Bezalel or Bezaleel (Hebrew: בצלאל, Beẓalʼēl; "Name means::in the protection of God") (b. ca. Born::2483 AM–Died::2553 AM) was a member of the tribe of Judah and the master craftsman of the builder of::Tabernacle. When God gave Moses the detailed designs for the Tabernacle and its associated artifacts, He named Bezaleel as the lead craftsman and Aholiab, a Danite, as his assistant. 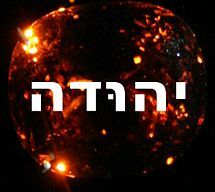 (Exodus 31:1-11 ) Bezaleel's special skill was in metalworking, woodworking, and working with precious stones. Aholiab's special skill was in fabric hangings, garment making, and embroidery. Bezaleel receives great praise in the rabbinical literature, though perhaps this literature exaggerates Bezaleel's abilities and gives too much credit either to the man himself or to his grandfather Hur and alleged grandmother Miriam. In fact the Bible specifically says that God called Bezaleel and imparted to him all the skill and wisdom he needed to complete his task. 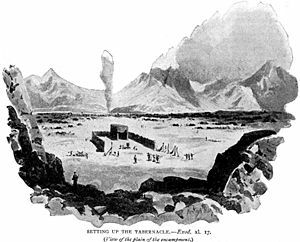 In any event, the Tabernacle would remain the dwelling place of God on earth until King Solomon built the first version of the Temple of Jerusalem. Bezaleel appears frequently in the names of schools of design, and of firms specializing in design of various projects, large and small. ↑ 1.0 1.1 1.2 Jastrow M, "Bezalel," The Jewish Encyclopedia, 1906. Accessed January 16, 2009. ↑ Blank W, "Bezaleel," Daily Bible Study, July 30, 2006. Accessed January 16, 2009. ↑ "Bezaleel," WebBible Encyclopedia, n.d. Accessed January 16, 2009. This page was last modified on 2 April 2013, at 15:50.